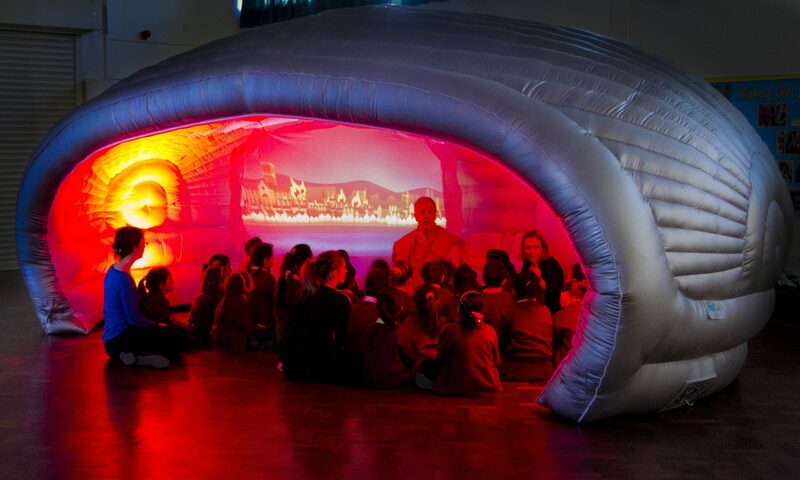 Last week we were invited to run a Creative Workshop in the 4D Immersive Space at St Christopher’s Primary School. We sent our INSET practitioner extraordinaire Gav to run a story telling session in the 4D Immersive Space. We developed a series of incredible new images, sounds and lighting states to help transport the pupils to the deck of the ship in1912. The soundscapes were particularly impressive and were designed by our most recent intern Lauren. Gav told the story of the Titanic from the perspective of Lawrence Beesley, a survivor of the disaster . By changing the atmosphere in the 4D Immersive Space with light sound and projection, he was able to get the pupils into the mindset of the passengers and encouraged them to think about the feelings and emotions of those on board. Something that had previously felt like a historical project, now felt very real to the young people learning. As a new member of our team, Gav has joined us to improve our training and INSET options. A former drama teacher and creative practitioner, Gav is able to show how you can really use our immersive spaces to inspire pupils. He can also explain how to use our 4D create software to create incredible immersive learning environments in non techie language! If you’d like to find out what other INSET and creative workshops we have available, just get in touch! Here’s a letter we received this week from a pupil at St Christopher’s. The workshop will explore the impact of immersive learning environments and how using found materials, projection, lighting and sound can allow creativity to flourish across the curriculum from EYFS right through to Key Stage 2. The session is packed full of practical, affordable and achievable ideas to take back to your own school! NB Both sessions will be identical and include a brief tour of the 4D Immersive Space. This event is your chance to check out this incredible immersive space we have recently installed at the school and meet the team behind the design. You can experience how one press of a button can completely transform a space and how our team have created an incredible new learning environment. Numbers are limited for both events so head over to our ‘Open Days’ Registration Page’ to book your place! Alternatively, if you are unable to attend this date but want more information you can send us a quick message and we will be in touch. Cathy’s first blog for the Guardian went live yesterday and so far the reaction has been fantastic. In the piece, Cathy explains some of her den making background that is still central to everything we do at 4D. You can read the piece at the Guardian’s site via this link or the full transcript is below. Schmidt’s point goes deeper than a critique of today’s ICT teaching. He was highlighting the divisions between those who teach and learn humanities in Britain and everyone else in the science and engineering “camp”. Schmidt encouraged UK educationalists to reunite art and science, something that Apple’s founder Steve Jobs had advocated the benefits of many years earlier. In an interview with the New York Times in 1997, readers were reminded that Jobs had once said the Macintosh turned out so well because the people working on it were musicians, artists, poets and historians who also happened to be excellent computer scientists. This enforced separation between technical and creative teaching and learning is something I see a lot in schools. I make my living as a den-maker – helping teachers morph dull classrooms into thrilling learning environments. Technology is essential to what I do, as important as the fabric, boxes, plastic hoops and giant envelopes I use. I might project images of children working in a 19th century mill on the walls for a lesson on the industrial revolution. Sounds of the hum and crash of machines and the drip of water trickling down the walls is piped into the room. Lights are darkened and students are asked what it feels like to be twelve and working fourteen hours a day in a damp factory. Children touch cold metal parts from an old weaving machine and feel the clumps of cotton threads which they might have had to clear from under machines if they had lived in Manchester 200 years ago. They see a bloodied bandage on the floor and talk about the dangers of working in a mill. Suddenly the atmosphere changes and pupils stop what they are doing. We are in a state of the art computer factory, down the road in Manchester. Pictures of hi-tech machines fill the walls and the zoom and whiz of technology is heard all around us. Flashes of light convey a busy working environment. The children build a modern day work station complete with computer, desk, phone and iPad. Using large cardboard speech bubbles they talk about the differences between this twentieth century factory and the old mill. How have working conditions changed? How have the industries in their city developed in the last 200 years? It’s this combination of low and high-tech resources that enables immersive learning to take place. Children see, hear, touch and imagine new ways of finding out about the industrial revolution. They ask questions, want to know more, they are keen to try things for themselves and own their learning. This is something you might not get from using text books or a video. The key is integrating technology and creativity. I will never give up the bobbly white blanket, the large cardboard tubes, the crackly blue plastic sheet and bucket of polished stones that I use in many schools. But when these found materials are combined with sound, projected image and light to create an imagined environment, children are totally engrossed in the experience. They begin to empathise with twelve year old children in the Victorian era who had to work long hours and risk their fingers on sharp machines in the damp textiles mill. Their understanding is enhanced and they begin making links. Yet in so many schools today science and the arts are kept separate. Children sit on their own in front of computer screens completing maths games rather than using video cameras in the school grounds to make films about number patterns in nature. Lights are saved for the school play, audio equipment for modern foreign language lessons. Instead we need to use ICT to create socially rich experiences, right across the curriculum. It’s great that Michael Gove is encouraging teachers to use gadgets in computer science to develop the vision, imagination and creativity of children but what about drama or geography, history or creative writing lessons? We need to get better at using electronic resources creatively to make learning and teaching more effective. • Cathy Cross is creative director of 4D creative. Find her on Twitter@cathy_cross. We place all our orders in batches – this helps us keep our prices low. If you’d like to place an order for a 4D Pop Up, get in touch with our friendly team who will talk you through the options and answer any questions you may have. To see a 4D Pop Up in action. We’re going out on the road in June and you can come along to experience the impact of the 4D Pop. Our team will be on hand to show you the endless possibilities of the space and you’ll be able to place an order there and then. If you can’t make either event, why not come and see us at MediaCityUK? We will be happy to host you and your colleagues at our offices and give you a guided tour of the 4D Pop Up. Just send a quick email to hello@4dcreative.co.uk and we’ll do the rest. Register below using the quick form or get in touch via our contact page.